So you like beer, do ya? You like soft, subtle, luscious bubbles that meet your lips in an oh so caring manner? Nice balanced malts, a tender kiss of hops that bring home memories of a simpler time? Well, if that’s your idea of beer you may want to steer clear of Avery Brewing out of Boulder, Colorado. You can use words like “Big”, probably “Bold”, maybe even “Extreme” if you want, but that doesn’t begin to describe what you’re getting yourself into with Avery. Okay, Avery also puts out some of the finest session ales and lagers that you’ll find West of the Mississippi (Or East of it for that matter). Their 14er ESB, named after the 54 fourteen-thousand+ foot peaks in CO, is as subtle as they come and is really the antithesis of my last argument. Where I look to Avery though is for their over-the-top, bigger beers that have a tendency to torture your tongue in the best of ways. Today, ladies and gentlemen, I bring you the Avery Maharaja Imperial IPA. Part of the Dictator Series (Along with the Kaiser Imperial Lager and Czar Imperial Stout), Avery’s interpretation of an Imperial IPA is spot on. Traditionally, an Imperial or Double IPA will be an amped up version of an India Pale Ale with a stronger, more assertive hop profile and a higher ABV. The style is a study in balance between malt and hops, with each addition of the former causing another addition of the latter. Avery starts out with an obscene malt backbone that pushes this brew up over 10% ABV. To balance the sweetness they toss in 4 varieties of of West Coast American hops to reach a level of 102 IBU’s (Sierra’s Pale Ale is 37 IBU’s by comparison). The bitterness from the hops is extremely high, but the malty presence brings your mouth back down to Earth (Albeit with a few lasting burns). Poured from a 22oz bomber into whatever clean glass I had left from my house being flooded for days on end, the Maharaja presented with an amber hue and a clean off-white head. Citrus, floral, pungent – The nose was filled with hops upon hops upon hops. The first sip scorches the tongue a bit, but you’re immediately reminded of the care that Avery takes to their craft as all is balanced out in the finish. There’s a certain tangy, lip-puckering effect that you’d get from sucking on a lemon. I call it akin to shucking the lime before you take the shot of Tequila instead of at the end. Many Imperial IPA’s seek to cave your face in with an enormous amount of hops, but Avery takes the right approach by punching you in the teeth but giving you a nice little hug right after. Again, balance. Mouthfeel is hefty, to the point that you can tell how many ingredients actually had to go into this beer to get it up to the bittering and alcohol levels. If you can hold your own with the alcohol demons, the drinkability would be pretty high with the Maharaja. At just over 10% ABV though, I wouldn’t recommend taking down the whole 22oz unless you’re not doing anything for the rest of the night. Aside from the alcohol, you won’t be able to taste anything after anyway. You can pair this beer with stinky blue cheese or a glass of water. It really doesn’t matter, all you’ll taste is beer. I feel like I’m being too liberal with giving away another 4 hop rating, but what can I say, I know how to pick good beers. This beer is seasonal, but if your package store carries Avery you may be able to find it year-round. Imperial IPA’s running $10 a bottle tend to stick around for a bit. 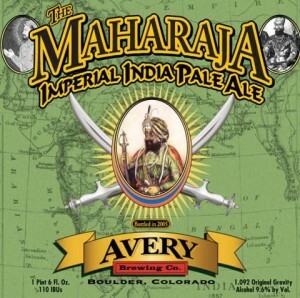 Posted in Tasting Notes.Tagged Avery Brewing, Colorado, Imperial IPA, Maharaja. Just picked up another 6 bombers at bevmo.. How about that awesome new label… It even tastes different….even better…..